Performers include: Mark Harmon, Michael Weatherly, Pauley Perrette, David McCallum, Sean Murray, Cote de Pablo, Lauren Holly, Brian Dietzen, Sasha Alexander, Rocky Carroll, Joe Spano, Scottie Thompson, Pancho Demmings, and Stephanie Mello. In this spin-off of JAG, the Naval Criminal Investigative Service (NCIS) investigates crimes to people or property affiliated with the U.S. Marine Corp. or U.S. Navy. Major Case Response Team Supervisor (MCRT) for the NCIS, Leroy Jethro Gibbs (Mark Harmon), demands the very best from his team. 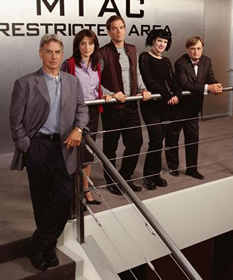 They include immature, ex-homicide detective Anthony Dinozzo (Michael Weatherly); ex-Secret Service agent Caitlin “Kate” Todd (Sasha Alexander); Goth forensic specialist Abby Sciuto (Pauley Perrette); MIT graduate Timothy McGee (Sean Murray); and medical examiner Dr. “Ducky” Mallard (David McCallum). Cases investigated include an Air Force commander dying on Air force One, a Navy lieutenant gone missing, and bodies appearing at a Naval base. But no case hits as close to home as when team member Kate is killed by a terrorist. In their grief, the team bands together, with the help of Mossad Ziva David (Cote de Pablo), to avenge her death. Ziva then joins the unit in Kate’s place. When NCIS Director Thomas Morrow (Alan Dale) leaves his position for Homeland Security, Jenny Shepard (Lauren Holly) takes his place. This proves to be a distraction for Gibbs as the two have a personal history. Later on, Leon Vance (Rocky Carroll) becomes the NCIS Director. agree I have not watched since she started. Take her off you have rid my favorite show. I like this show but wish Pauley Perrette had not left the show. So no wrinkle cream and that leads me to believe it is all a publicity stunt as Perrette didn’t want to get locked into NCIS forever. Now her replacement is actually more annoying than Abby was. We just cannot win. The producers do not know what comedy is when they try to do Comic Relief. Seems like some of those should have gone too. Pauley Perrette is a good actress, but when they (script etc) have her do Comic Relief she is annoying. Now, if………the person that replaces her uses Perrette’s wrinkle cream, that person will be gone too. Otherwise this is one of the best shows on TV. Hope it never ends. That ad for the face cream is FAKE! !